Canada, and other developed countries, need to improve their ability to drive prosperity through innovation yet this goal has been elusive. A recent article in Harvard Business Review “Special Forces” Innovation: How DARPA Attacks Problems written by Regina Dugan and Kaigham Gabriel provides some new insight into this problem and in particular how Stokes’ research model can help to make better R&D funding decisions. There are many reasons cited for Canada’s poor innovation performance such as low competitive intensity due to the small population, low population density due to the large geographic area, low VC funding, risk aversion, lack of entrepreneurial spirit, and lack of ambition. There is also no urgent necessity driving a need to innovate in corporate Canada. Experts often look at Finland’s commitment to an innovation-led economic strategy which ‘arose due to the severe economic crisis of 1991 and simultaneous impact of near collapse of the domestic banking system and massive export disruption du to the disintegration of the USSR’. Urgent necessity only exists in several localized areas: 1) youth who see lean software start-ups as their only choice for a good career, 2) clean tech for those who think that global warming is real. Canada’s complacency stems from being a stable country, high wages, social safety net, stable food supply, affordable cost of living such that the majority of population are well off. Also Canada came out of the financial crisis fairly well off. Canada also has no natural enemies to drive defence R&D similar to how the cold war fuelled Silicon Valley’s development before the emergence of venture capital funding. 2) R&D funding is provided to firms indirectly through R&D tax credits as opposed to direct funding. Industry does not fund more R&D because 98% Canadian firms are SMEs who can’t afford to invest much in innovation. Most Canadian SMEs have no ambition to grow being content with selling to their local markets. There are also a lack of mid sized firms in industries who could commercialize R&D being undertaken in Canadian universities. 527 mid-sized companies reportedly vanished between 2007 and 2010 representing a drop of 3.6 per cent compared with a rise of 2.6 per cent of the overall number of new Canadian firms according to numbers compiled by the Business Development Bank of Canada (BDC). There is also a lack of industrial strategy aligned with Canada’s strengths and misalignment between business and universities. No sustained plan to target new emerging industries is evident and large research endeavours tend to lose focus and attention as multiple competing agenda’s erode economic exploitation. So it is difficult to build momentum with misalignment, lack of focus, bureaucratic complexity, geography, lack of large firms, etc. My own study in Alberta’s innovation system revealed the lack of focus and low return on investment from R&D investments made in Alberta universities over the last decade. 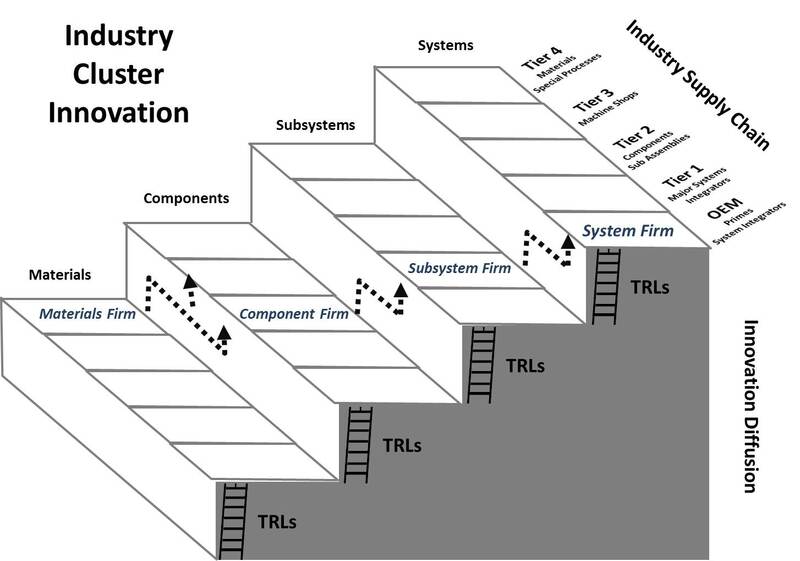 Dugan and Gabriel’s paper use Stokes’ research model to explain DARPA’s success. Stokes’ research model is very useful to understand why Canada has not fully benefited from the significant investments in R&D spent at Canadian universities over the last 15 years. Pure Basic Research (Bohr Quadrant) – Curiosity driven research that is directed at seeking foundational knowledge without consideration of practical use characterized by the work of Niels Bohr. 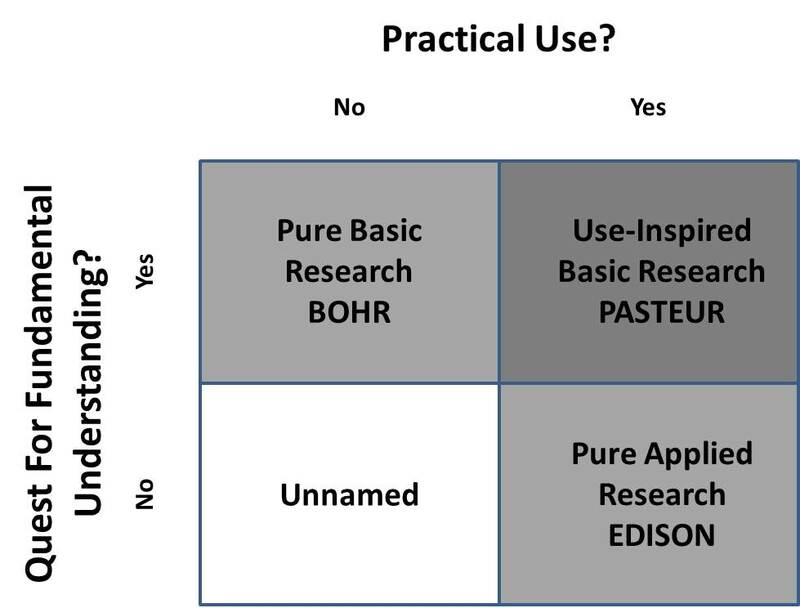 Pure Applied Research (Edison Quadrant) – Pure applied research that is directed at finding a solution to a real problem with no interest in explaining the underlying scientific phenomena characterized by the work of Thomas Edison. Use-Inspired Basic Research (Pasteur Quadrant) – Research that is directed at expanding basic scientific knowledge in order to meet pressing societal needs characterized by the work of Louis Pasteur. 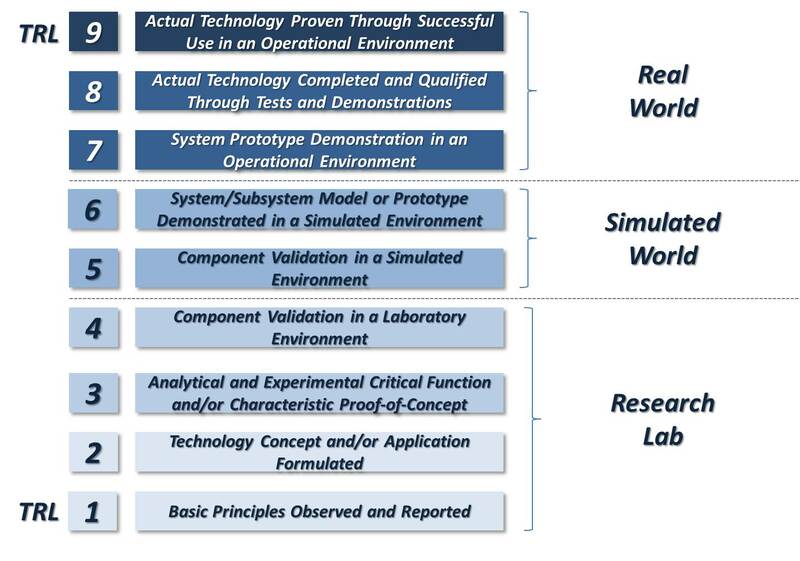 DARPA is a leading example of an organization that has adopted this type of research with results demonstrated by their achievements as described in Dugan and Gabriel’s article. Unnamed Quadrant – Research that is neither scientifically interesting or useful was left unnamed. 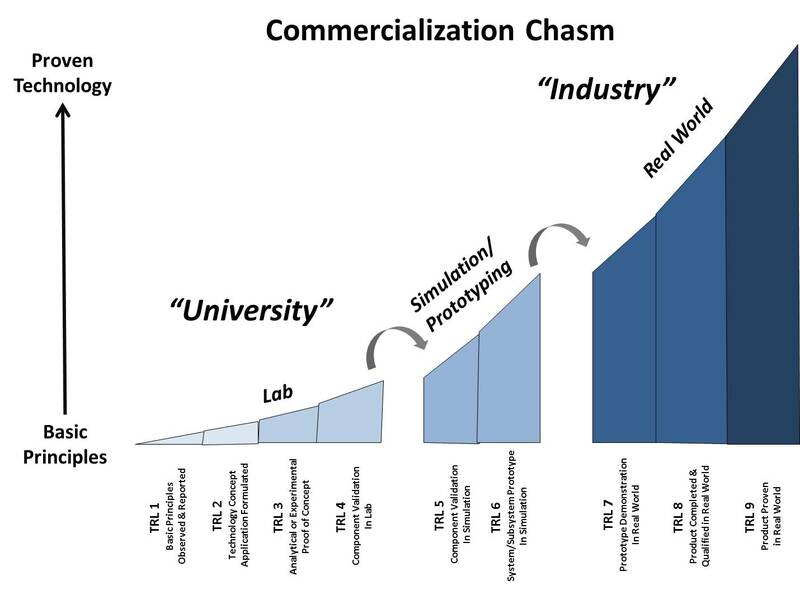 Stokes’ model suggests that Canada’s approach to R&D funding at universities tends towards Bohr’s quadrant which is not clearly driven by practical use – although eventually it may be commercialized it is not at the speed-to-market demonstrated by DARPA in Dugan and Gabriel’s article. The Canadian federal government has begun to make changes by reorienting NRC to focus on commercialization and is working to consolidate the many government R&D funding programs. This is akin to emphasizing Pasteur quadrant research in the Stokes’ model. Also the federal government is seeking to leverage defence procurement through key industrial capabilities for better economic outcomes. Although far from a DARPA model this approach is linking a need to the drive research. While the government is moving the right direction there has been significant push-back from university researchers who feel that pure basic will be harmed by focusing more on commercialization. Ongoing pressure by the Alberta government to change the university research system to foster more commercialization is running into increasing resistance from academics. Unfortunately the government-university debate is highly emotive and often presented as a black or white, either-or type situation by the university researchers. The Stokes’ research model suggests that Canada could take a more holistic view of allocating research funds. 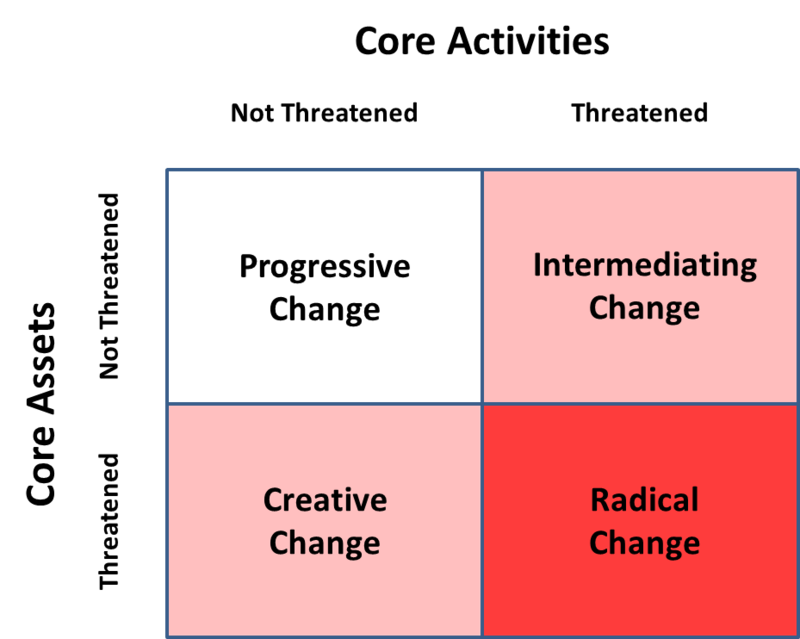 The Stokes’ research model also provides a means to take a more balanced approach by establishing how university R&D research investments would be allocated between the three quadrants. Canada needs more Pasteur quadrant research and bring clarity/balance to how R&D investments are allocated to each of the Pasteur, Bohr, and Edison quadrants. To implement recommendation 1 a balanced team of leading thinkers and public/industry engagement should create and prioritize a list of pressing needs whose solution would create economic benefits and national/societal good for Canada. National priorities and industrial strategies should be aligned as previously discussed on this blog. Several grand challenges (not solutions) be selected from this list that should receive significant funding employing a DARPA style approach. Innovation performance metrics that measure time to market should be incorporated into the current innovation scorecard that has deficiencies. Adopt the DARPA approach (described very well by Dugan and Gabriel) to achieve faster-time-to-market results for Canada’s pressing needs identified in recommendation 2. In terms of a balanced portfolio of R&D investments in Canadian universities more work is needed to determine what the optimum balance should be between Pasteur, Bohr, and Edison quadrants. This entry was posted in Innovation and tagged Alberta on October 2, 2013 by Andrew Reif. BCG released their 2013 Most Innovative Companies survey results and their list of the top 50 firms (registration required to access). Focus is on large multinational brands. Several of the main observations. Top management commitment to innovation as a competitive advantage. Firms leverage their IP in both defensive and offensively to strengthen their competitive advantage. 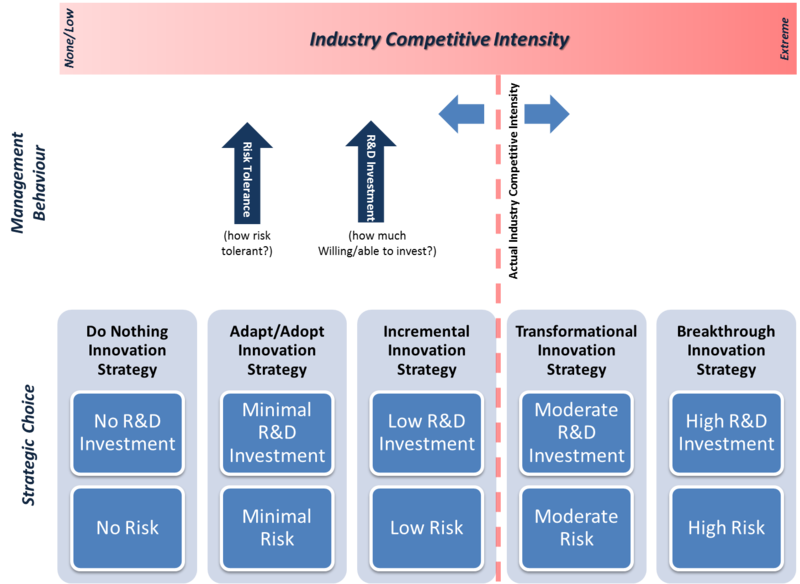 Firms effectively manage a portfolio of innovative initiatives. Firms have strong customer focus. Firms insist on strong innovation processes that leads to strong performance. The report observed the advancement of many of the leading automotive firms in the rankings as the firms strive for higher fuel efficiency, higher safety standards, and mobile device integration. Notably aircraft and aircraft engine innovators who are also striving for higher fuel efficiency in air transportation were not mentioned. Although Boeing and GE makes the list at #13 and #32 respectively Airbus and Pratt & Whitney do not make the list. There are no leading Canadian brands on the list although several top 50 firms access Canadian knowledge talent with branch plant operations for example – Google (#3), IBM (#6), GE (#10), P&G (#23), and Shell (#26). Canada’s weak product development mindset and poor independent innovation performance remain underlying problems. Shell and ExxonMobil were the only energy leaders making the list. 85% of strong innovators expect to spend more on innovation and new product development than last year. Leaders are focusing and making smarter investments. Fewer firms reported changing directions once started. Firms are improving their innovation process performance. Judgment of senior management for determining which ideas to move to product development was adopted by two thirds of firms. Strong innovators listen to customers. The importance of firms leveraging their IP for competitive advantage was growing. This entry was posted in Innovation on September 30, 2013 by Andrew Reif. Insight into the innovation investment behaviour by large (>$100M) firms was recently revealed in a report by Accenture who surveyed 519 firms in US, UK, and France representing Banking, Capital, Retail, Electronics, High Tech, Health Providers, and Consumer Goods & Services. 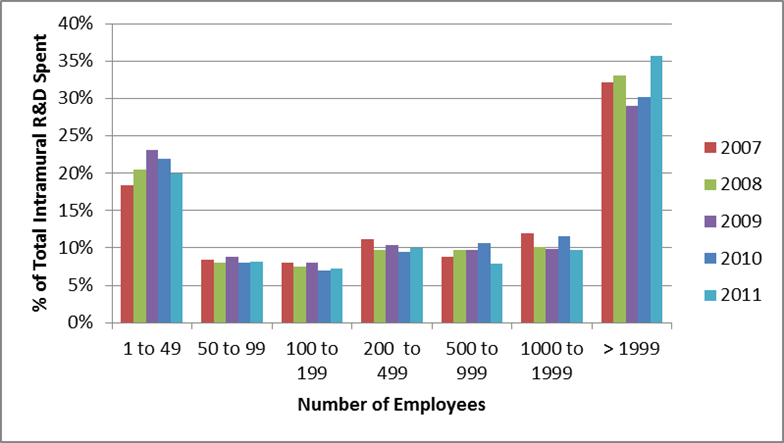 Data was provided comparing innovation performance in 2009 with data from 2012. Innovation as a Strategy – Fully 70% of the firms responded that innovation was one of their top 5 priorities with 18% being the top priority. 44% of manufacturers reported that innovation was extremely important to respond to “persistent change”. Only 34% firms believe they have a well defined innovation strategy in spite of 70% reporting that innovation was a top 5 priority. Innovation Investment Mix / Emphasis – 48% new product or service, 26% new process or business model (down from 30% in 2009), and 24% improvement or modification of an existing service (up from 17% in 2009) leading to the conclusion that large firms are taking a more cautious approach to innovation than 2009. Investment Levels – 51% firms responded that they increased funding devoted to new products and services with 74% of manufacturing firms increasing innovation investment levels. Innovation Performance – Only 18% believe their innovation investments are delivering competitive advantage. 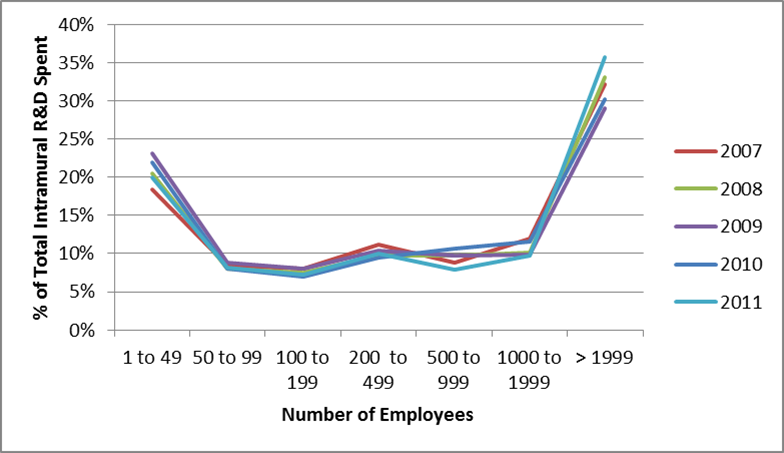 Only half of management from the large firms feel their innovation system is effective. Better performance was achieved by firms with formal innovation systems in place with 51% of such firms being first-to-market as opposed to only 17% with those with no such system. Innovation Shortfalls – 46% firms have become more risk adverse (shying away from breakthrough innovation and preferring incrementalism). Firms with formal innovation systems tend to pursue breakthrough innovations more than incrementalism and report 50% more likely to see innovation deliver competitive advantage. Challenges to Innovation – 30% firms noted predicting future trends as a challenge. 27% firms reported achieving cost containment as a challenge. 26% firms reported securing ongoing budget support as a challenge. 26% reported leveraging new technology as a challenge. 24% reported transforming new ideas into marketable products and services as a challenge. Not reported though were growth performance over this period for firms with formal innovation systems to determine if such firms that have adopted innovation as a strategy are edging ahead of firms that have not. 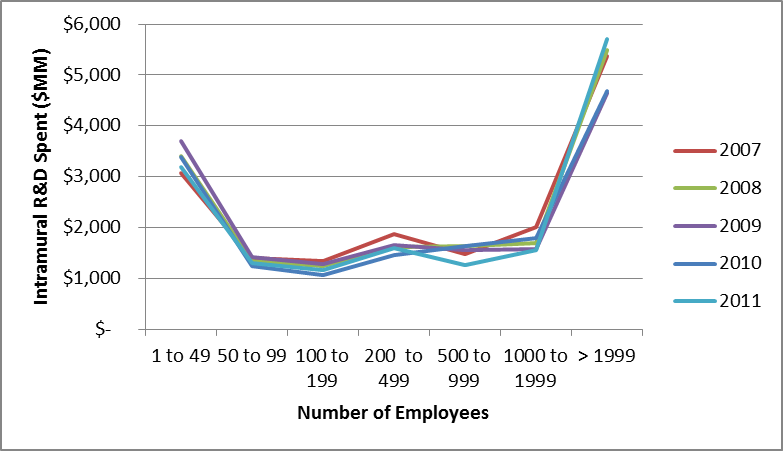 The data provide interesting benchmarks to compare with SMEs firm populations. This entry was posted in Innovation on September 10, 2013 by Andrew Reif.